Adventure is a huge part of fly fishing for me. During a conversation on our camping trip, I was telling my buddy Joe how I enjoy exploring almost as much as the actual fishing. Thankfully I was able to enjoy both on this trip. On Sunday, I arrived a bit later than Joe. Coming from Central time into Eastern time always makes it hard to get up and on the river as early as my friends. Getting there at first light means being up to leave around 3 or 3:30 a.m. No thanks... 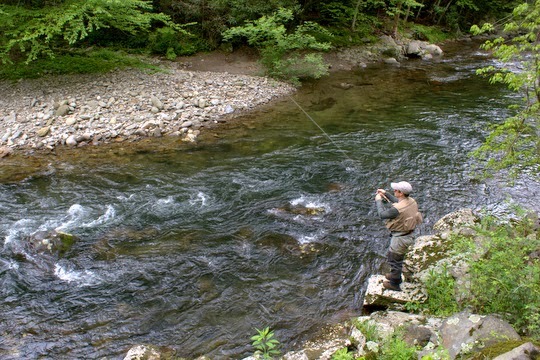 Anyway, so eventually I did make it over there and when if found Joe he was already hard at work fishing a likely run. He reported good early morning action on the usual nymphs and we decided to continue fishing up through a nice mix of pools and pocket water. 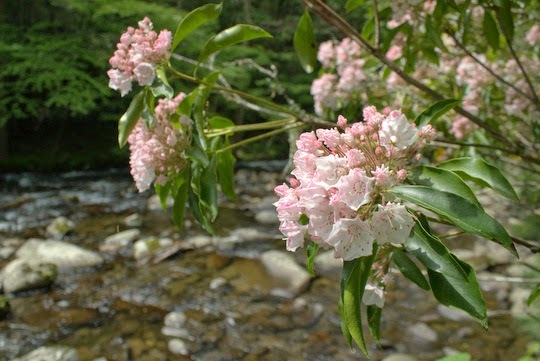 Not too far upstream, I came across Mountain Laurel and stopped to play with the camera a bit. Just above the blooms, Joe worked a really nice run. When he finished and headed down to the truck for some lunch, I noticed a few rises and moved up into the run. Tying on dry flies, I worked the fish hard but in the end was humbled. If I had known how spooky those fish would be I probably would have brought a 3 weight and also used a longer leader. 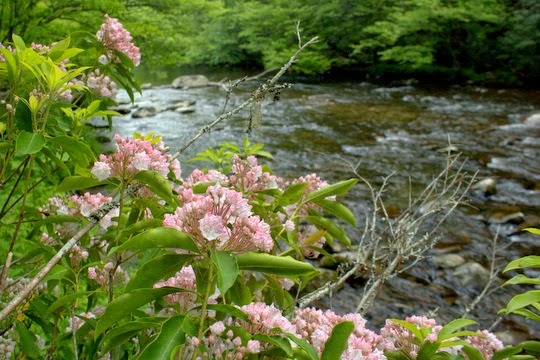 Dry fly fishing is excellent on Little River right now, but the long still flats on the roadside stretches may produce some challenging conditions. It was every bit as tough if not more so than chasing a picky riser on a tailwater. Anyway, eventually we had lunch, set up camp, and headed back out for an afternoon of catching fish. We both caught a lot of nice trout on nymphs and eventually made it back to camp to rest up for the next day's action. We fished on both sides of the mountain and hit up some stretches that were new to both of us. One of my favorite parts of the trip was exploring a stream known as having the ability to produce the Smoky Mountain Hat Trick. After a fairly early start, we made it over to the stream on day 2 and started fishing by looking for nice browns in the larger holes. While Joe worked the pools, I fished the pocket water. A double nymph rig seemed appropriate early in the day. Wet wading was a little chilly with the temperature hovering right around 50 degrees in the early morning shade. 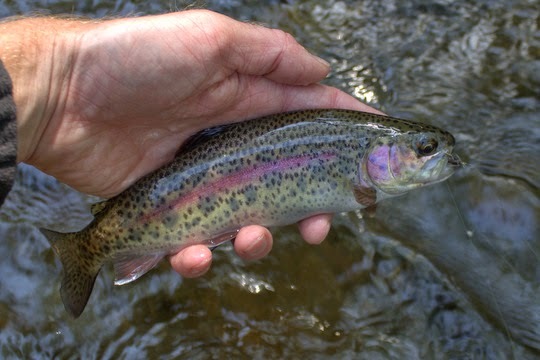 Hatches were pretty much nonexistent but the rainbows were feeding well subsurface. 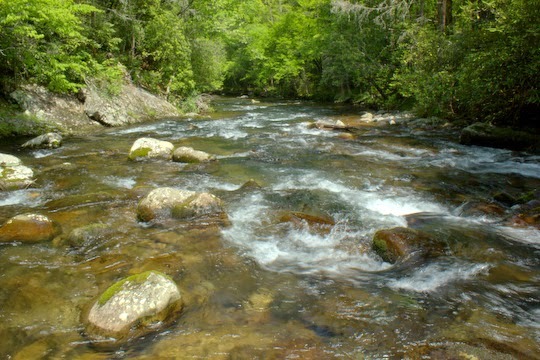 This is where I picked up my better rainbows on this stream. Strangely, neither of us caught a brown trout in this stretch. By the time things had warmed and the sun was triggering some hatch activity, we decided to head upstream and look for the slam. 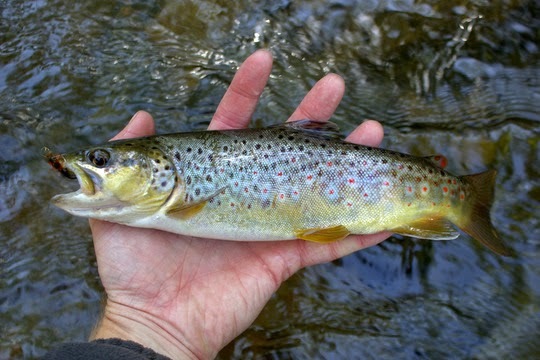 I found the brookie before I found the brown. Both came out of fairly fast but large pockets. 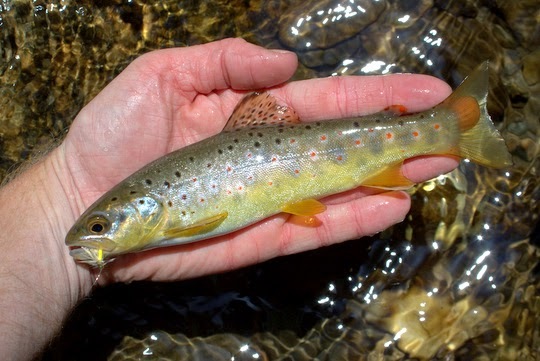 The nice dry fly runs were not producing for the most part. 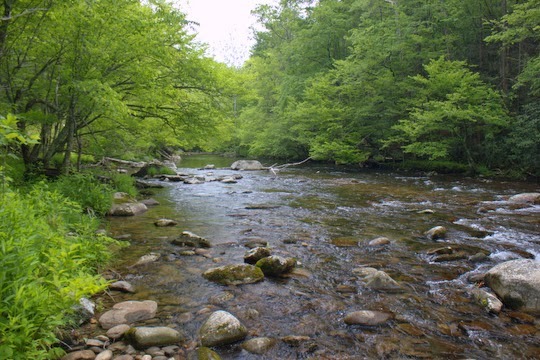 After a ton of effort to fish maybe 1/4 or 1/3 of a mile of water, we got tired at the lack of fish and decided to head out and hit up another brook trout stream. 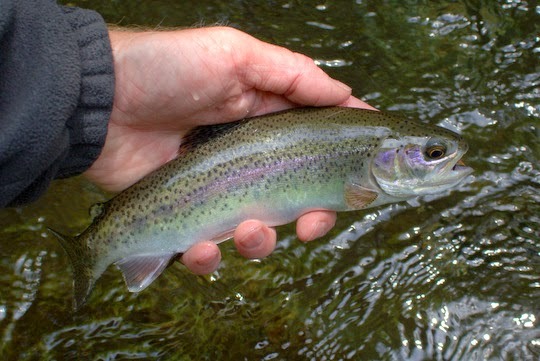 That was a good choice as we caught a lot of trout although the number of rainbows was a concern. 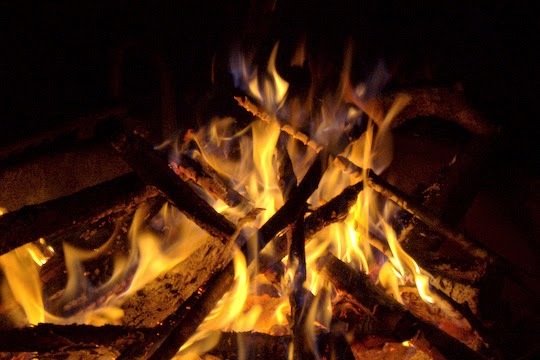 That evening, we had a good fire as it was our last night. Staying up late, talking about trips from past years, we reminisced about our Yellowstone Trip (here and here also) as well as the epic one day fishing trip in Colorado last year. 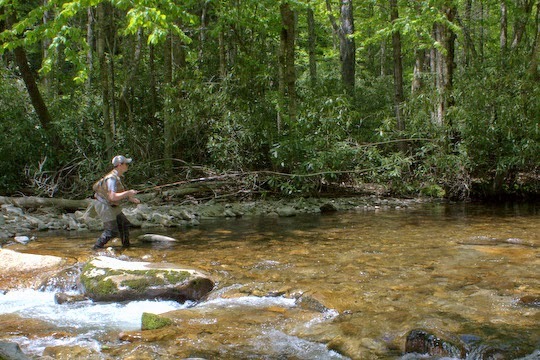 Good days fishing the Smokies, large fish caught, and lots of other topics kept us up late but not too late to be up early the next morning. Joe didn't have long to fish the next morning, so after fishing just a little together, he took off, and I decided to hit up a favorite stretch of Little River. 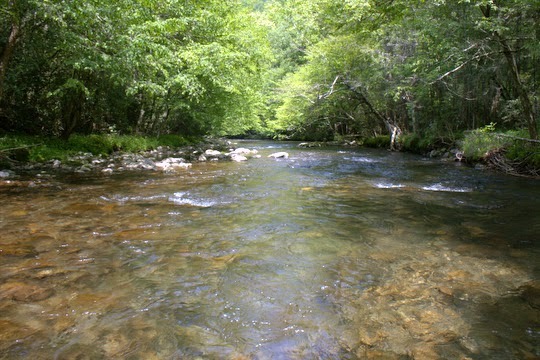 The water here is a nice mix of pools and pocket water, classic Little River water if you know what I mean. In the first pool, I caught 4-5 trout and probably could have caught more if I had chosen to. Best of all, most of them were browns. 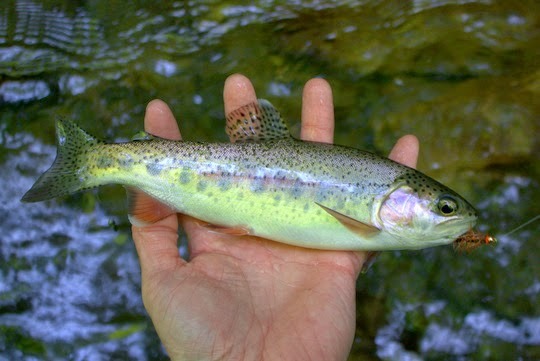 I continued fishing until around 2 in the afternoon when hunger started to gain the upper hand over my desire to fish. On the way out, I found a hat hung on a rock in Little River. If you happen to have lost one while fishing, it is now over at Little River Outfitters in Townsend. For this last day, I'll just let the pictures speak for themselves. Bill, I did manage some fish on dry flies, mostly Yellow Sally imitations. I was tight line nymphing the whole time. I rarely use an indicator unless I'm fishing a larger pool where I make longer casts.